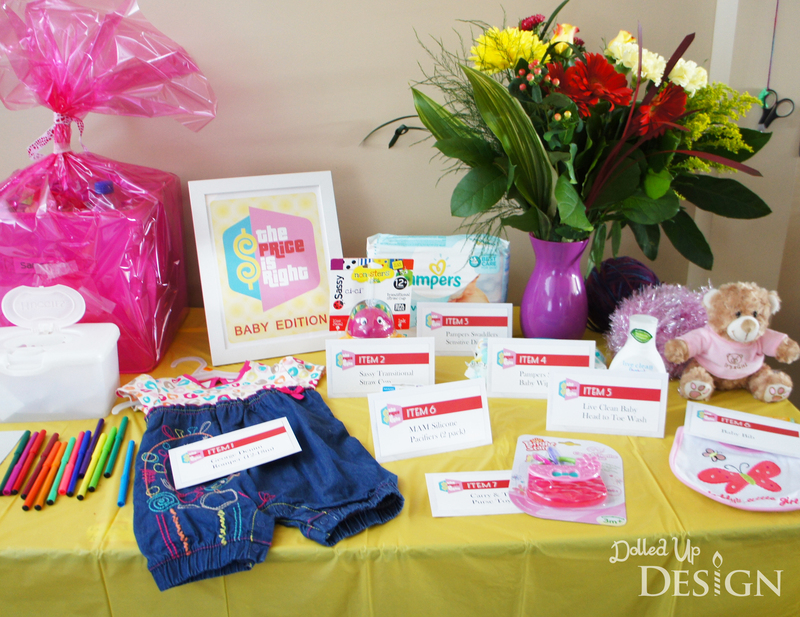 When my good friend asked me to help with her daughter’s baby shower it was an easy yes. I knew she would be undergoing back surgery just a few weeks before the shower so it was a good way for me to lend a hand during her recovery period. She also gave me plenty of months notice which always makes it that much easier to agree to. It was nice to be able to help out a friend by doing something I love, and lucky for me she trusted me enough to pass full creative control over. 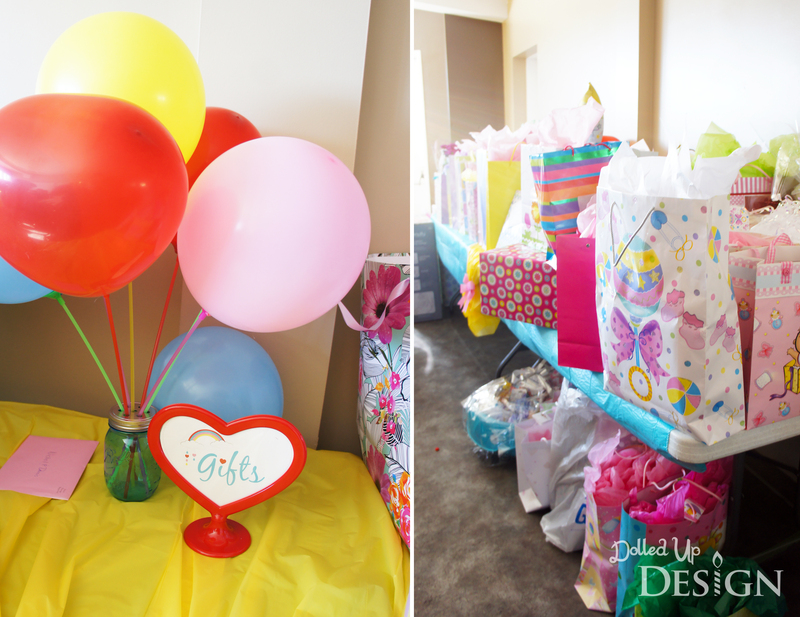 I had attended the gender reveal party so I knew the baby was going to be a girl and spent a lot of time perusing pinterest to try and come up with the perfect girly theme. 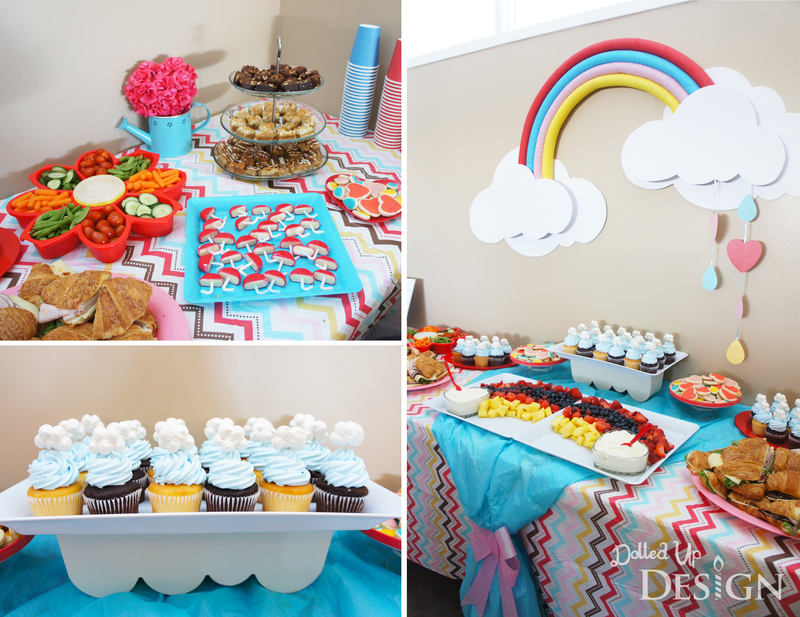 I had seen these chevron printed tablecloths at Target that I loved, so I decided to pick a couple of them up to use for the food table. 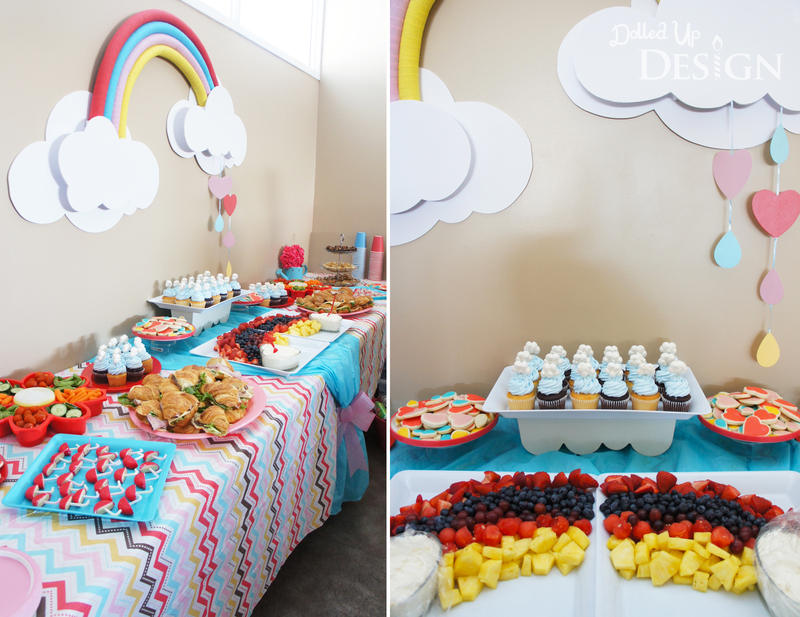 The baby is due in April so my mind went to April Showers which helped me settle on a rainbow theme using the color scheme from the tablecloths. 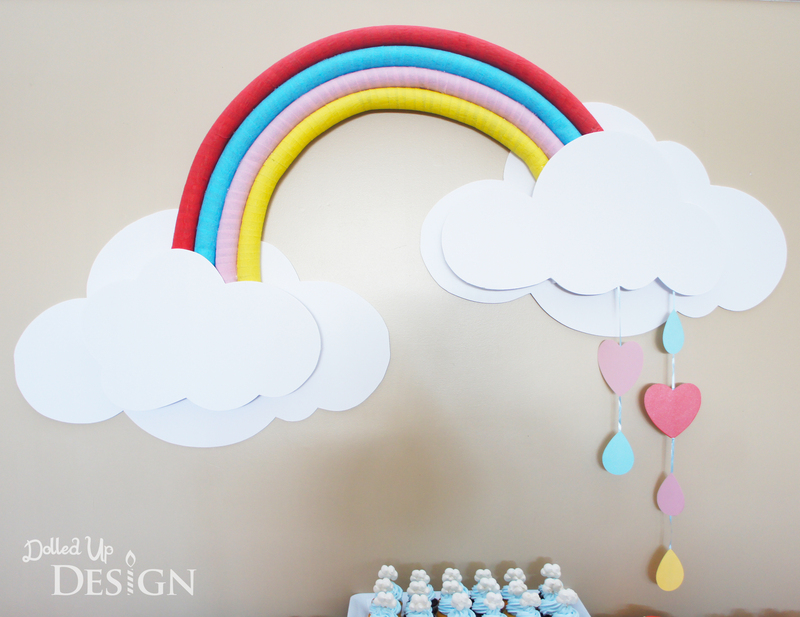 My main decoration was a large rainbow and clouds I crafted to hang on the wall. The clouds were simply cut from white foamcore and I created the rainbow by winding colored streamers around tubes of foam plumbing insulation. I was able to find the foamcore at the dollar store and the insulation tubes were reused from the Olympic Rings I had crafted for my sons birthday party last year, making it a very inexpensive party decoration. 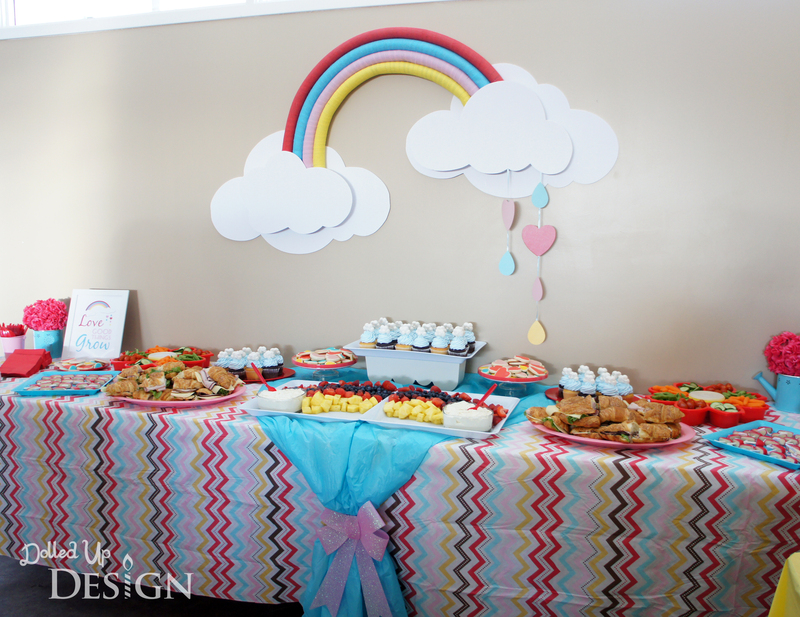 Guests were greeted into the hall with a simple sign I designed to match my rainbow decoration. 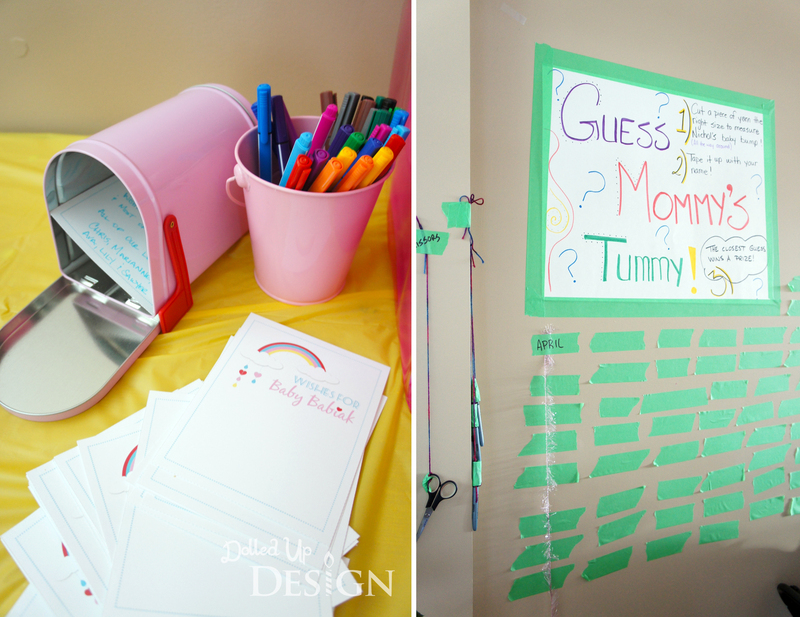 Inside, they were invited to make their mark on a fingerprint guestbook and help create a lasting reminder of the day for the sweet momma-to-be. 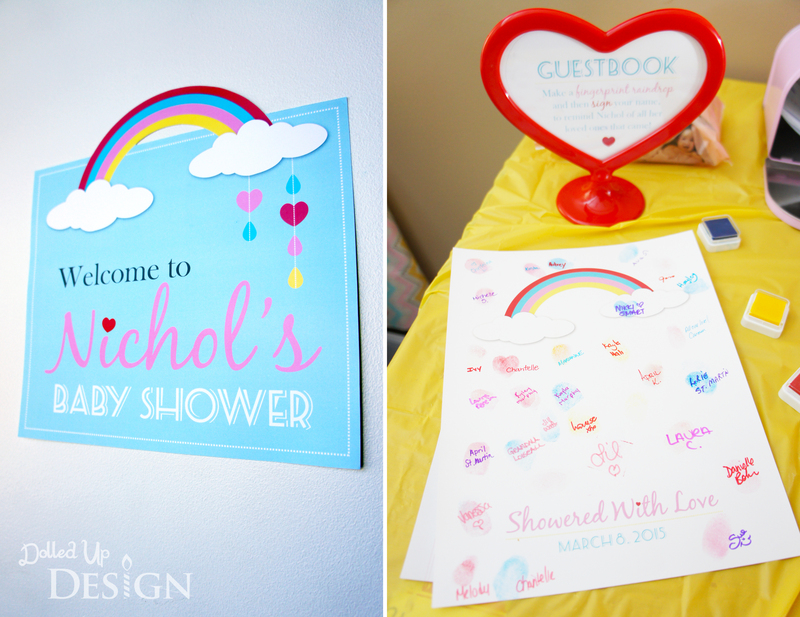 I have always loved the idea of a fingerprint guestbook and I thought fingerprints lent well to becoming little raindrops under my rainbow and cloud graphic. Alongside the guestbook were cards where everyone could write their wishes for baby, and then place them into an adorable pink mailbox I found on clearance after Valentine’s day. I found some cute watering cans at the Dollar Store and filled them with a fake rose arrangement to use on the food table. The baby’s name will include “Rose” so it seemed fitting. I also did some quick subway art with the phrase “Love makes good things grow”. 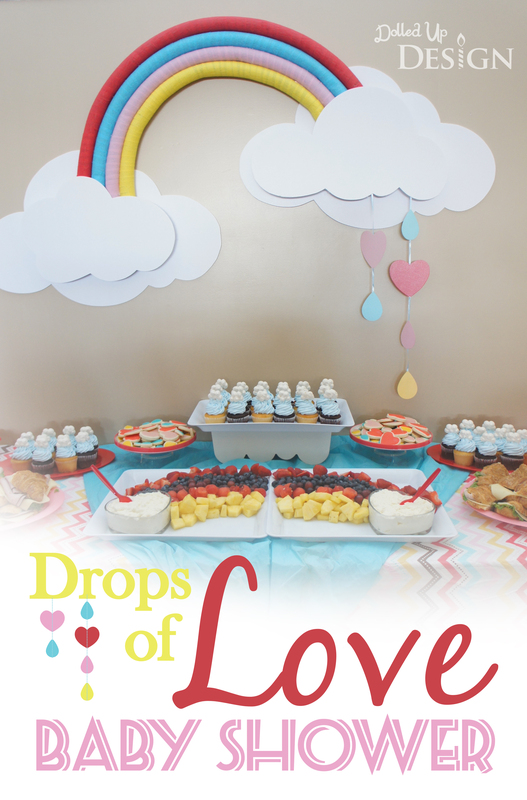 The heart and raindrop shaped sugar cookies were baked and decorated by myself. They were a bit time consuming, but I was really happy with the way they looked piled on the small platters throughout the table. 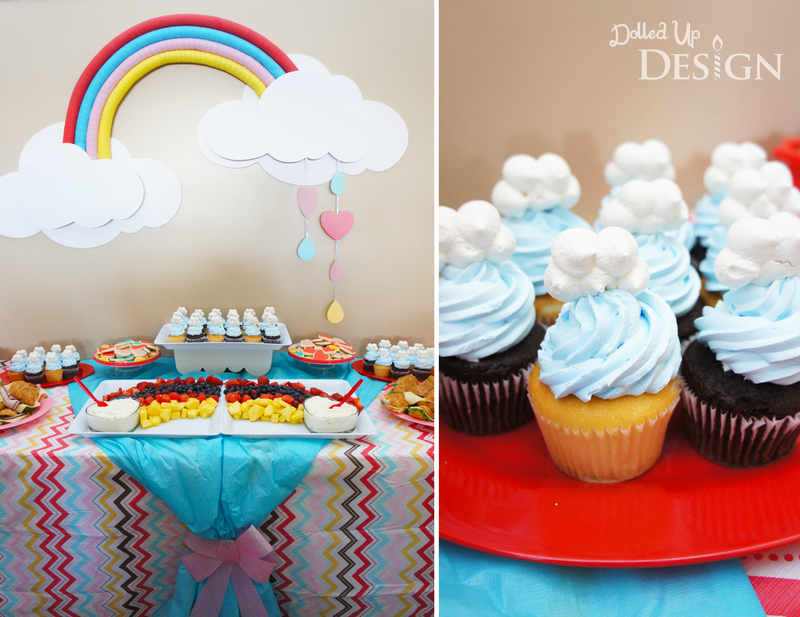 The cupcakes were ordered through Walmart and finished off with cloud shaped toppers I baked out of meringue. 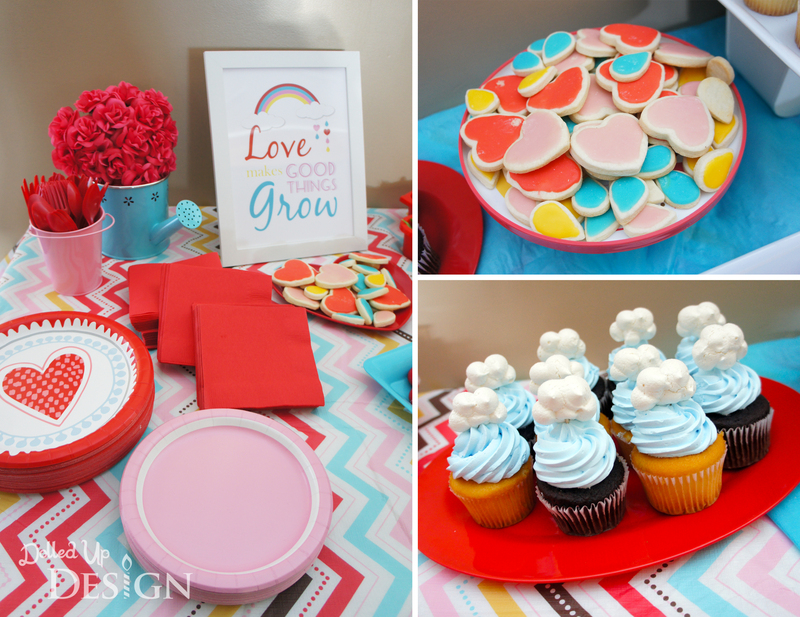 They fit perfectly with the theme and I was pleasantly surprised just how darn tasty those Walmart cupcakes were! I normally bake my own, but I might have to keep them in mind for my next party. 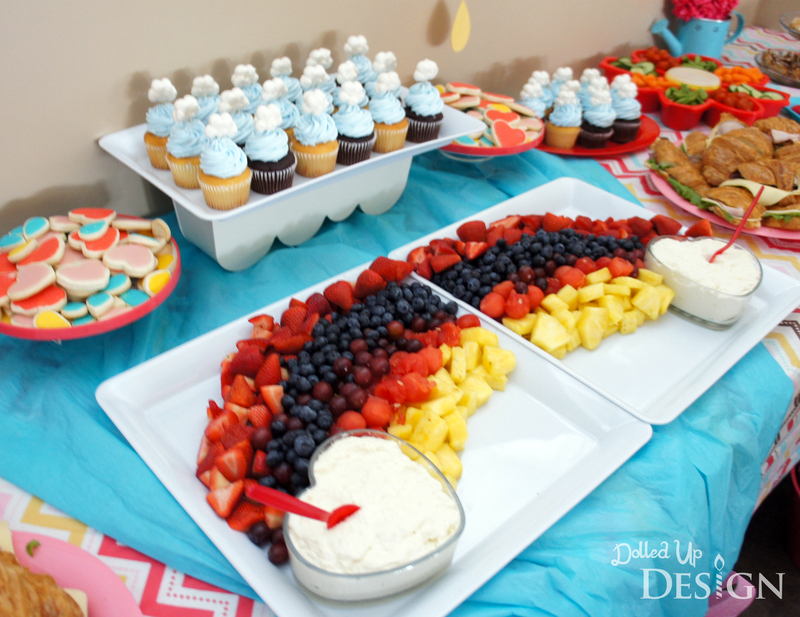 The fruit was displayed as a rainbow and served with clouds of white chocolate creamcheese dip from heart shaped bowls I bought at Dollar Tree. I tried to keep to my color scheme and used strawberries, blueberries, red grapes, watermelon balls and fresh pineapple. 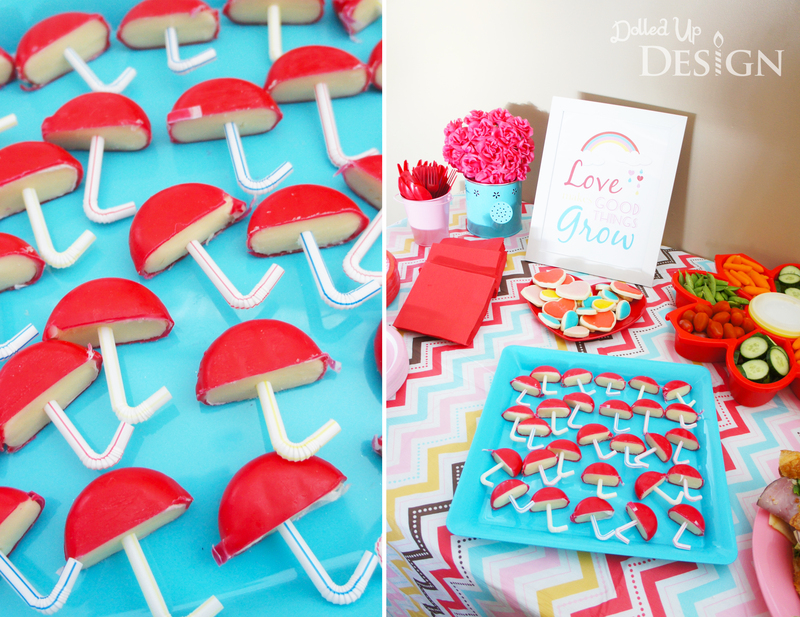 One other fun detail I “borrowed” from Pinterest were these tiny umbrella’s from half a round of Babybel cheese and a plastic bendy straw. I had the straws trimmed down ahead of time so it was easy to cut the cheese in half and assemble them right before the party. I always find shower games tricky so I decided to reuse one of the ideas from my sister’s Elephant themed baby shower. Everyone there seemed to enjoy the baby version of Price is Right, so I decided to revamp my artwork and use it again at this shower. 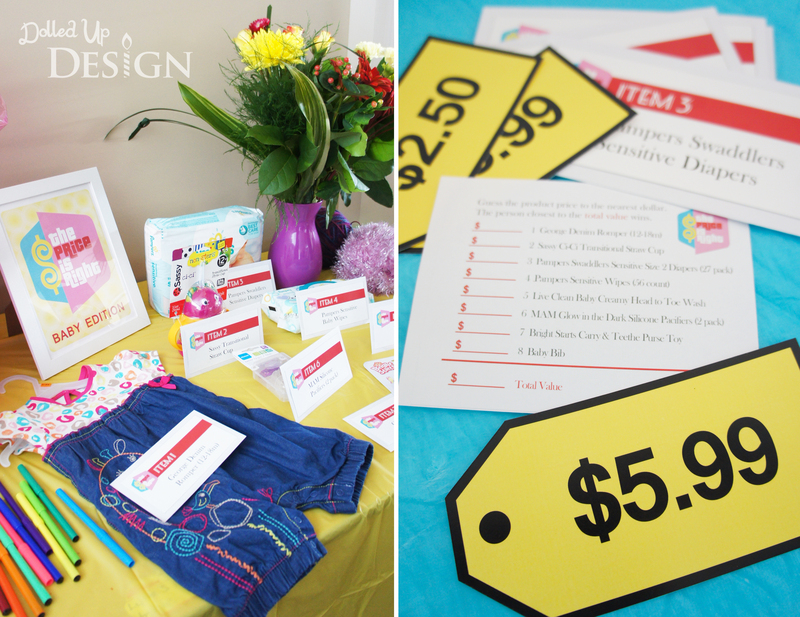 The printables were designed with the color scheme in mind and I think the best part of the game was watching the momma-to-be try to match the price tags to the right products. She did fairly well, only mixing up a couple of the prices. It turned out to be a lovely afternoon and I loved the way all my details came together to give a bright pop of color and remind us that Spring and other good things are on the way! Momma-to-be was beyond spoiled by all her close family and friends and should now be more then ready to welcome that sweet baby girl into the world in the upcoming weeks. I can’t wait to meet her!